Now viewed across the lawn and meadow, the houses evoke the settlement’s rural character. From the September 2014 issue of Landscape Architecture Magazine. Nearly 50 years ago, a cluster of old houses, set slightly askew, was “discovered” in Brooklyn’s Crown Heights neighborhood. They had been surrounded and concealed by newer structures aligned to the modern street grid. These modest cottages were the last physical trace of Weeksville, a self-sufficient farming settlement founded by freed African Americans after slavery was outlawed in New York in 1827. An organization soon coalesced to document the history and preserve the structures. 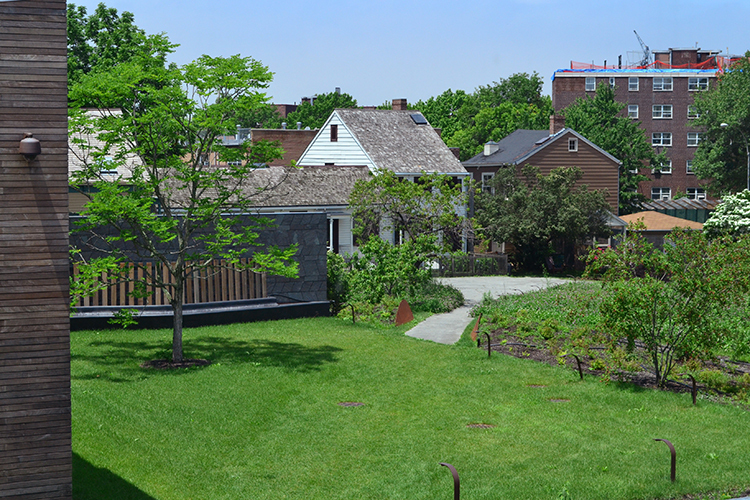 These years later, the newly completed Weeksville Heritage Center has wider ambitions: both to celebrate the area’s black history and to foster its present-day cultural vitality. The historic houses have been restored and are joined by a dazzling new building with exhibition, performance, research, and classroom spaces. Between them is an outdoor area meant for active programming and historical interpretation. Elizabeth J. Kennedy, ASLA, the designer, says, “One challenge was to make the historic land use patterns apparent.” Another was to reveal the idiosyncratic route of long-erased Hunterfly Road, originally a Native American footpath, which the old houses had fronted.